The DriveRack® Premium provides all the processing you need between your mixer and amplifiers to optimize and protect your loudspeakers. With the latest advancements in dbx’s proprietary AutoEQ™ and AFS™ algorithms, a new input delay module for delaying the FOH system to the backline, Ethernet control via an Android®, iOS®, Mac®, or Windows® device, and updated Wizards, the DriveRack Premium continues the DriveRack legacy of great-sounding, powerful, and affordable loudspeaker management processors, for a whole new generation. With the RTA Mic “listening” to your room, the new, updated DriveRack Premium AutoEQ algorithm sets speaker levels and room EQ automatically in a matter of seconds. This means room adjustments can now be made very quickly, without subjecting the audience to annoying, lengthy broadcasts of pink noise. Nothing turns audiences away like annoying and potentially painful audio feedback. Fortunately, dbx engineers have revisited their already-stellar Advanced Feedback Suppression algorithm and made it work even better. The DriveRack Premium listens for and anticipates feedback and adjusts speaker output automatically before it even has a chance, while never altering your sound. Wizard functions on the DriveRack Premium guide you through easy, step-by-step processes to help you get the most from your loudspeaker system. 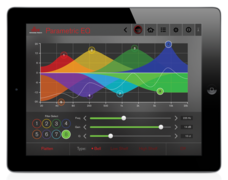 Helps you easily configure level balancing, AutoEQ, Advanced Feedback Suppression, and provides access to built-in and constantly updating speaker tunings from most major speaker manufacturers.